What it’s like: We were blown away by the 27-acre village. Seriously, we would be happy to live here. You wouldn’t know the residents were recently homeless until you start to hear their stories. Bonnie flew down the walking path in her wheelchair to greet us. She told us she hasn’t felt this at ease or at home in years—that she finally has a place where no one looks down on her. Community First provides more than just shelter. Residents can learn new skills and crafts, like metal- or woodworking, and can tend vegetables and raise animals. The community breaks down stigma, too, by welcoming in the greater Austin community in for outdoor movie nights. If the tiny house life appeals to you, this breakdown of the types of communities out there will help you zero in on the right spot for you. Both tiny house communities will be walkable neighborhoods with retail spaces and shared amenities including a fitness center and plenty of green space. What it’s like: Brett and Mindy were pleasantly surprised by the close bonds they formed with their new community. It’s a big family, composed of their own three kids, plus Rae, who is in her 20s, and three retirees—Cheryl, Robyn and Donna. After spending a few days here, we felt like part of the family, too. There was a communal vibe, and often at least a couple of neighbors were lounging outside or helping each other with household projects. Until recently, tiny house dwellers had to remain under the radar. They mostly lived in the backyards of relatives, hoping that no neighbors would turn them in. Cities did not consider tiny homes to be legit dwellings. They were too new, too outside the box, too much like an RV to fit into existing zoning codes. But now, a growing number of states and cities are updating their codes to welcome tiny homes. As a result, developments that cluster tiny homes together as a community are on the rise. Interested? Find out what it’s really like to live in a tiny home community. Construction is starting, reserve your space at Habitats Tiny Homes. The big idea: The first and biggest obstacle to tiny house living is finding a place to build your house. Drew Crawford struggled with this when he built his home, which inspired him to create DIY Tiny. This community offers a space to build, plus advice and help from the residents, all of whom have built their own tiny homes. It’s a supportive place to build and then move on, or to stick around long term. DIY Tiny is now looking for financial partners—ideally future residents—to work together to buy enough property to accommodate 12 to 20 more tiny homes. 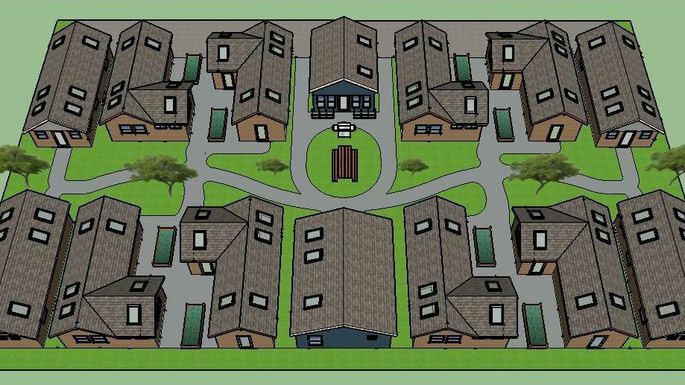 The second project is a subdivision in Walsenburg, Colorado with 33 micro homes ranging in size from 260 to 670 square…MORE feet. Sale prices start at $60,000. The big idea: The most common tiny house arrangement is the small backyard co-op, a semi-communal mini-neighborhood of private homes clustered around community spaces. Residents typically share ownership and maintenance responsibilities. These co-ops fly under the radar—you might not even know if there’s one in your neighborhood. Sites rates range from $450 — $595 per month, including utilities. A discount in rent will be given while your home is under construction. They also have a few tiny houses for sale, and they welcome vintage trailers. A resident of Tiny Lots on the Prairie tackles a paint job outside her home. Another rental option for those wanting to try but not buy a tiny home is Caravan in the vibrant Alberta Arts District of Portland, Oregon. All six tiny homes, ranging in size from 120-170 square feet, are constructed by local builders and decorated with Portland art, as well as fair-trade, sustainable products. Using the homes to create a circle, Caravan cultivates a wonderful gathering space for music, games, and conversation. Guests can even roast vegan marshmallows over the fire pit. In fact, there are many places where micro house dwellers currently live…MORE side by side in the U.S., and more are in the works from eco-villages to vacation retreats. Here are 15 tiny house communities that are shaping the future of small space living. Lower cost of living, higher quality of life, and more time to live; these are the benefits of going tiny, according to Lake Walk Community. Situated just outside Greenville, South Carolina, the lake-side property has 43 sites on 15 acres for tiny house owners looking to park in the woods. Nature trails, mountain views, communal gardening, and a community center with a fire pit are all some of the perks for residents. 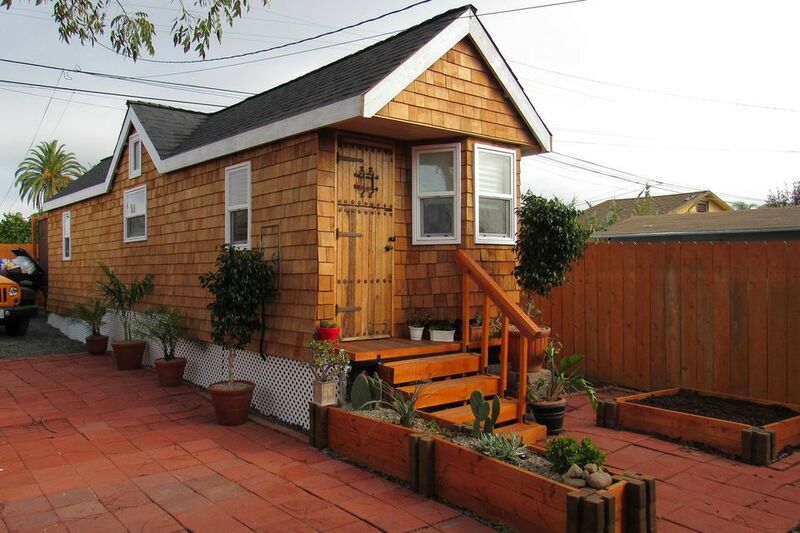 And for visitors, Airbnb listings of specific units offer the loveliest tiny-home vacation. What it’s like: When we made our second visit to Orlando Lakefront recently, we could see the plan had paid off. There are now 22 tiny houses in the community, which sits at the edge of a lake just 10 minutes from downtown Orlando. We loved the active vibe, easy dock access and spruced-up grounds. James Taylor, a digital nomad who can work from anywhere, invited us to a party at his tiny house with neighbors ranging from their 20s to their 60s. We swapped tiny house living stories and laughed until our cheeks hurt. Before we left, Adam took us on a short sunset boat ride to a new restaurant. As we left the dock, a new resident waved to us from his paddle board. At the center of this burgeoning community in Effingham County is an organic farm surrounded by woods. 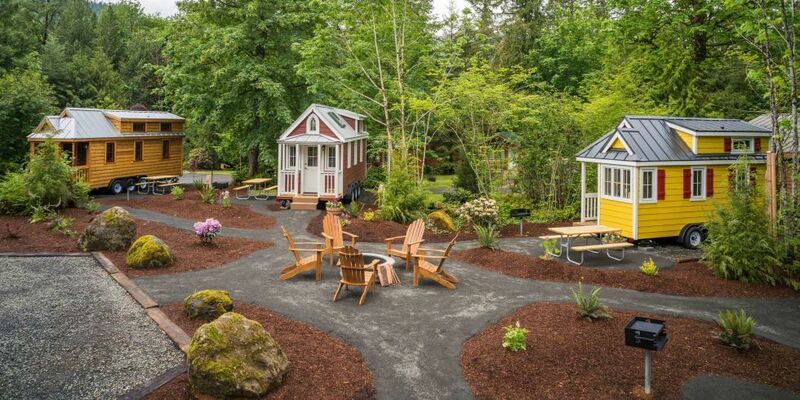 Tiny house dwellers can purchase a one-acre lot for their homes starting at $30,000. Smaller plots are available for lease at $300 per month. Whether you decide to buy or rent, all residents have access to a four-acre community garden for growing your own produce. The big idea: In 2014, the itty-bitty town of Spur, Texas, had dwindled to 900 residents. As a way to attract new residents, the city government proclaimed the entire town tiny-house friendly, loosening building codes and zoning restrictions. This made Spur the new frontier for the tiny-house movement. After a ton of press and rapid-fire word-of-mouth, the town has sold more than 61 lots and welcomed 26 new tiny-house residents. And they’re eager for more. One of the local masterminds behind the revitalization effort, Dave Alsbury, told us that Spur has the infrastructure to support 3,000 residents. Others like this: Swap in a more suburban location and vibe, and distant cousins of Llamalopolis include Lake Dallas Tiny Home Village, planned to open this summer in an old residential neighborhood just outside Dallas, and Keyo Park West, a wooded tiny- and small-home subdivision in the culturally rich city of Charlotte, North Carolina. By our count, there are now 50-plus tiny-home communities from coast to coast, and that’s only the beginning. Every time we visit a new state, we hear about more that are in the planning stage. These communities come in several different types, each catering to a different crowd and addressing a different need. Some attract retirees looking to trade in square footage for free time. Others are made for digital nomads who are escaping cubicle life to work remotely. And others are experiments in how to address the affordable housing crunch. “Simple Living on the Lake” is the motto for Ohio’s new and first full-fledged tiny home village. The community celebrated its grand opening in August and offers Modern Tiny Living customers up to 30 lots – some water-front – to park their house for good. Walking paths, community gardens, a recycling program, mature trees, and close proximately to the Natural Springs Resort are just some of the many perks to living on this lake-front property. Homebuilder, Jay Shafer became the face of the tiny house movement after he penned and published the Tiny House Book in 2009. Currently, he’s developing the first tiny house community in California’s Sonoma “Wine” Country. Homes average around 400 square feet with lot sizes starting at 5,000 square feet. Each dwelling features state of the art appliances, porches, and, rustic-inspired interiors decked out with reclaimed wood flooring and ceilings. A unique and inspiring movement, Community First! 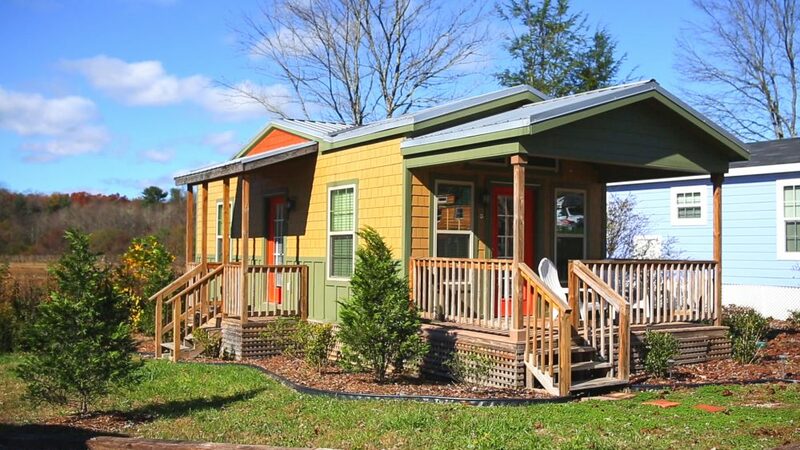 Village is a collection of 140 micro homes, 100 RVs, and 20 canvas-sided cottages offering affordable, permanent housing and supportive community to the disabled, chronically homeless in Central Texas. Tiny homes on the 27-acre grounds are designed by talented architects from around the world and furnishings are obtained through generous donors. Property amenities include a medical facility, walking trails and gardens, outdoor movie theater, community market, wireless internet, bed & breakfast for visiting guests, and convenient access to the Capital Metro bus stop. Moreover, it’s a place for those who are hurting to heal and rediscover hope in a dignified way with the support of the community. Tours of the property are offered on select Sundays throughout the month. The village has around 30 dwellings, a mix of Airstream trailers and pint-size homes by Tumbleweed Tiny House Company. Monthly rent is $1,200 including…MORE utilities and Wi-Fi. But if plan to move in, you better like big furry creatures. Hsieh’s alpacas, Marley and Triton are usually roaming around the village. Fully developed communities are a relatively new concept, but here are a few of our favorite properties setting a wonderful example. For a variety of reasons from zoning laws to insurance for towing, tiny houses on wheels need to meet classifications for towable recreational vehicles. The upshot? Aging R.V. parks are now drumming up new business by welcoming these roaming homes. Green ​homebuilder, Orange Splot constructed the two 526 square foot ADUs shared here in a client’s backyard. 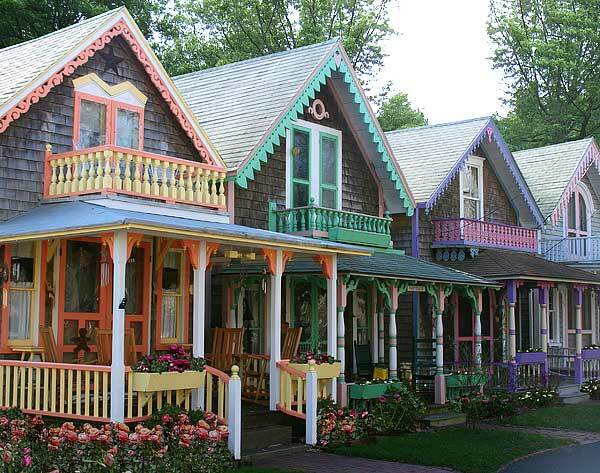 Dubbed, “Ruth’s Garden Cottages,” each one has a porch, full bathroom and sleeping loft….MORE The inhabiters share the kitchen in the primary dwelling. Need a spot to park your tiny house on wheels STAT? You can be one of the founding residents at The Sanctuary Minnesota Village. It’s a countryside oasis for adults only. Trying to decide if tiny living is for you? Or maybe you want a temporary tiny home experience for your next Rocky Mountain getaway? WeeCasa, located in the breathtaking mountains of Colorado, is tiny living for short-stays and vacations. With 22 tiny homes (casas) for nightly rental, WeeCasa offers vacationers a smarter and more sustainable way to travel. Each casa is different in both size and amenities – the largest sleeps five – and all homes are equipped with essentials for a comfortable stay. If you want to experience tiny living for a few nights, WeeCasa is a wonderful place to visit. Large parties are also welcome to book the grounds for gatherings and events for a truly communal experience. What it’s like: During our visit this past summer, EVE was under construction but coming along beautifully: The tiny homes are laid out with walking paths and lots of green space between them. And at a meeting, future residents worked together on a mission statement and a basic code of conduct. Others like this: It’s hard to know how many backyard co-ops there are. They are often informal and unnamed. But we’ve visited a half dozen ourselves, including Simply Home and The Commune. Tiny homes and minimal living have taken hold in the USA over the past few years. Low cost of living, simplicity, and the freedom to travel have inspired both homeowners and renters to opt for smaller dwelling spaces. In response to the movement, pop-up neighborhoods have begun to form across the country offering permanent residents, curious vacationers, and even those in need of housing, a place to park and do life with like-minded people. The pint-sized village consisting of 50 dwelling with private backyards will cater to ecologically aware small space dwellers. Edible landscaping, on-site farmers market, and a glorious urban garden are just some of the green amenities one can expect. The big idea: Park model communities have been popular with snowbirds for years, but the Village of Wildflowers is different. For starters, it’s open year round, a place where people can age in place in a tight-knit community. And two years ago it officially welcomed tiny homes, with a designated section for homes no larger than 400 square feet. What it’s like: A 1,200-square-foot house with two tiny homes in the backyard, Going Places is not at all out of place in its historic Portland neighborhood. It all fits just so, and still has room for a big garden. The five people and two pets who live here share the outdoor space and the kitchen, living room, bathroom and laundry room in the main house. We joined them for a bi-weekly shared meal and a meeting that opened with games and giggles but later turned to a serious discussion of official business. This is no casual arrangement. It’s a deliberate, thought-out community, a model that works well for people seeking an intimate, supportive environment of like-minded folks. The big idea: RV parks all over the country are reinventing themselves as hybrid RV/tiny house communities. This makes so much sense. RV parks have everything needed for tiny-house living—power, water and sewer hook-ups—making them the most hassle-free option for legally parking a tiny house. And tiny homes give deteriorating trailer parks a shot of fresh energy, an upgraded image and motivated young homeowners. Orlando Lakefront pioneered the idea and has been slowly revitalizing the park by replacing old trailers with tiny houses as longtime RV residents move out. Five of its tiny houses are available for short-term rental—a great low-commitment way to try out the tiny home life. Want to join a sustainable utopia of all things bucolic and pastoral near Savannah, Georgia? Consider Green Bridge Farm. Wheelhaus, a tiny home building company that specializes in luxury modular dwellings, partnered with Traverse Bay RV Resort in Acme, Michigan to create a community of pocket-size estates. Llamalopolis is a community of tiny houses and Airstreams on what was once a vacant lot in downtown Vegas. The big idea: There are now at least 20 tiny house communities designed for those transitioning of out of homelessness. A great example is Community First Village, a low-cost home for the disabled and chronically homeless residents of central Texas. The largest development in the works is in Salida, Colorado, also known as the “heart of the Rockies.” With 200 rental homes, it will be the largest tiny house community in the nation with homes ranging in size from 260 to 760 square feet. Just passing through? Open houses, tours, and community events happen on various dates; ticket information can be found on the Caravan website. Wandering the village’s walkways, we met so many locals out walking their dogs. One morning, we crossed paths with Ada as she hauled materials from her tiny home to the community garden she was kickstarting. At a potluck and bonfire later that day, we met a few more full-timers, plus a dozen potential residents, some of whom were considering buying a tiny house here and renting it out until they were ready to retire and join the community full-time. The rural community features amenities typically found…MORE in walkable urban neighborhoods like a dog park, community garden, and laundromat. Owned by Bill and Brenda Campbell, the pint-sized community is offering tiny house dwellers a place to park and live with a six-month minimum lease. Don’t own a small house? They also have a couple of homes available to rent. Sorry dog lovers, cats are the only pets allowed on the premises. But before you pack your bags, understand Spur’s rules for fun-size homes: Yurts and…MORE “natural” homes built with materials like straw, mud or clay, both earth homes, and straw-bale houses are examples, are not permitted. Also, no matter how small, all dwellings require an adequate foundation and flush toilet hooked up to local utilities. Also known as a granny pad or mother-in-law flat, an ADU is an abode built on a lot of an existing home. Teensy structures like these are always a fraction of the main house’s size. A community of tiny houses on permanent foundations is coming to St. Paul, Minnesota. All 36 units will be packing sustainable features that will reduce their carbon footprint by up to 93 percent compared to the typical U.S. home. All of the properties, which will range in size from 300 to 1,200 square feet will reside on individual 1.5-acre lots. Expect the average cost to be around $100,000. Habitats Tiny Homes is a custom building company that’s currently developing the first, master-planned tiny house community 11 miles outside of San Diego, California. Relaxed zoning laws have drawn tiny-house dwellers to sleepy Spur, Texas. You share them on Facebook and pin your favorites on Pinterest. Teensy dwellings are seemingly everywhere online, but when it comes to real life, are tiny home communities a real thing? Others like this: We’ve visited two other maker spaces that offer space to build a tiny home: the DIYCave in Bend, Oregon, and Green Anchors PDX in Portland, Oregon, where there are usually at least three tiny houses under construction. What it’s like: You enter on foot through a tunnel of trees and twinkling lights. This opens up to the “living room,” an outdoor space with a stage, lounge and two fire pits—all an extension of each resident’s tiny home, or “bedroom.” Our Llamalopolis neighbors were a mix of downtown professionals, traveling musicians, artists and entrepreneurs. It’s a place full of quirky charm, with roaming pet alpacas and a bi-monthly concert hosted by a resident professional musician. The downside? New residents must be recommended by current residents. The tiny homes on Village of Wildflower’s 26 acres draw a mix of retirees and vacationers. But the sustainable goodness doesn’t stop there. All homes will pack…MORE energy-saving features for reducing the community’s overall footprint including solar power and water reclamation. The tiny house movement goes suburban in two mountain towns. Sprout Tiny Homes in La Junta, Colorado is spearheading both projects. Homes to buy starting at $64,900 or you can rent starting at around $800 per month. All residents will have access to 19,000 square feet of green walking…MORE space. It’s incredibly peaceful out here, save Rae’s Chihuahuas—her “wolf pack,” tiny but mighty. We parked our home on one of the seven concrete pads, situated in a V-shape on the 7.5-acre property. The pads are staggered, which maximizes privacy and gives everyone fine views of the fiery sunsets and bright starry nights. This is tornado country, and each pad comes with tie-down anchors to protect against the prairie’s high winds. 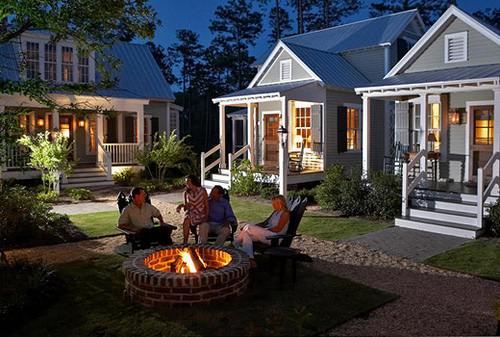 Which type of tiny home community can you picture yourself living in? Others like this: We keep running across rural tiny house communities in our travels, like the just-opened LuxTiny community in the White Mountains of Arizona. A revitalization of the 1950’s trailer park, Orlando Lakefront at College Park offers permanent parking space for tiny homeowners, as well as short and long-term rentals on Lake Fairview – just outside Orlando, Florida. Sunny, sustainable, and community-focused, this property is dedicated to maintaining the original spirit that first started the tiny house movement: simple living. Residents can spend their days out on the water, visit downtown Orlando (a short 7-minute drive), or simply relax and mingle with like-minded neighbors. Others like this: There are now 60+ tiny-friendly RV parks across the country, including Lemon Cove Village outside Sequoia National Park in California, Riverview RV Park in Loveland, Colorado, and Gracious Tiny House Park in Lake Okeechobee, Florida. Others like this: During our travels, we’ve visited five communities for those transitioning of out of homelessness, including Opportunity Village Eugene (OVE), a micro-shelter community, or—as residents like to call it—a gated community for the homeless. Two completed tiny homes sit on the property of DIY Tiny in the Blue Ridge Mountains. The big idea: Rural tiny home communities are picking up steam big time in states like Texas, Arizona and New Mexico. Out beyond the city and suburbs, a lot of zoning and minimum-size restrictions loosen up. That freedom inspired Brett and Mindy West to found Tiny Lots on the Prairie out in the wide-open prairie of North Texas’s big sky country. It feels like the middle of nowhere out here, but it’s actually within commuting distance—just 45 minutes—from Dallas/Fort Worth. What it’s like: DIY Tiny sits in the Blue Ridge Mountains, just 10 minutes from downtown Asheville’s galleries, breweries and restaurants. When we visited two years ago, there were two tiny houses set among the evergreen trees. Now there are six—at least three of which were built on the spot. It’s evolved into a creative community of makers and artisans who love working with their hands. While employment opportunities are sparse, local officials say self-sufficient individuals looking to set up a business will appreciate the cheap real estate. Likewise, the cost of living in Spur is 30 percent less than the national average. FYI, Salida, Colorado is a top retirement spot. Learn more at Sprout Tiny Homes. The teeny village zoned as an R.V. park will cater to small towable houses. Amenities will include community gardens and private storage units. No word yet when the development breaks ground. This charming Tudor-styled house is the first of many 300 square foot homes slated for construction in Detroit, Michigan. Most of the dwellings will have either a front porch or rear deck. All are available for rent to those who qualify as low-income. Tenants who stay a minimum of seven years will have the opportunity to own the property. Others like this: The vacation vibe is big among tiny-home dwellers, including those who like to try on the tiny home life while taking time off from “real life.” Tiny-home-friendly resort communities include Fairplay, Colorado’s Whispering Aspen Village and the Mill Creek Ranch Resort in Canton, Texas. Not many tiny house dwellers have a net worth of $840 million unless you’re Zappos CEO, Tony Hsieh. He happily lives in a 240 square foot Airstream with his two pet alpacas in Las Vegas, Nevada’s first tiny house community. Called Airstream Village, it’s a part of a project created by Hsieh to revitalize the city’s ailing downtown. Others like this: We’re excited to visit Tiny Homes Detroit, a pocket neighborhood that’s revitalizing vacant lots with rent-to-own tiny homes priced to be affordable for minimum-wage earners. Five people and two pets share the garden and common rooms of this Portland co-op, called Going Places. A good example is the Orlando Lakefront at College Park in Orlando, Florida. Built in the 1950s, it has a new life as a tiny house community after years of decline. Downsizing doesn’t mean giving up cushy interiors or gorgeous scenery according to LuxTiny, a custom homebuilder that specializes in small, luxury dwellings. They’re in the midst of creating the first tiny house community in the White Mountains of Arizona consisting of 45 spaces on six acres. Lease rates for plots are $360 or less. You can build your small dwelling on a lot you can live on at Lemon Cove Village. It’s a tiny house friendly RV community nestled in the foothills of the Sierra Nevada in California, a short drive from Sequoia National Park. We’re traveling the country on a Tiny House Expedition, with our own tiny home in tow. Tiny homes have brought fresh life and a new look to Orlando Lakefront. Accessory Dwelling Units are turning backyards in Portland, Oregon into mini tiny house communities. AT A GLANCE As the tiny house movement gains momentum, states and cities are updating their codes to make it easier to build—and live in—tiny homes. As a result, entire communities of tiny homes are on the rise. There are now more than 50, by our count. Tiny home communities come in several different types. To figure out if the tiny home life is for you, take a look at the types of communities we’ve found in our travels. Others like this: Tiny house friendly towns are becoming more common. Places to look into include Rockledge, Florida; Fresno, California; Nantucket, Massachusetts; and Walsenburg, Colorado. For more details, watch our docu-series Living Tiny Legally on YouTube. Whispering Aspen Village is a tiny house community 38 minutes away from Colorado’s Breckenridge ski resort. For as little as $100,000 you can own land and a park model tiny house by EcoCabins to enjoy as a primary residence or second home. What it’s like: When we visited in 2016, the first three of the tiny houses had just begun to breathe life into what had been a dying town. We spotted plenty of dirt-cheap lots with horizons that stretched for days. The historic downtown is almost a ghost town—many residents told us how they would love a coffee shop. The town is truly in the middle of nowhere—it’s a solid hour to Lubbock, the closest sizeable town. You’d need to bring your own job—or to create one. On our visit, we stayed on the land of Denise Rosner, the second tiny house dweller to come to town, who told us that even though she was used to big cities, she was loving the serenity of country life. The big idea: In an effort to attract residents back to its vacant lots, downtown Las Vegas went for a full-on reinvention, encouraging new businesses, especially at the Lego-style Container Park. Another big part of the revival is Llamalopolis, a gated tiny-home village that’s walking distance to restaurants, bars, shops and—yes—casinos. For billionaire founder Tony Hsieh, the idea was to recreate the creative camp vibe of Burning Man with a group of his close friends. 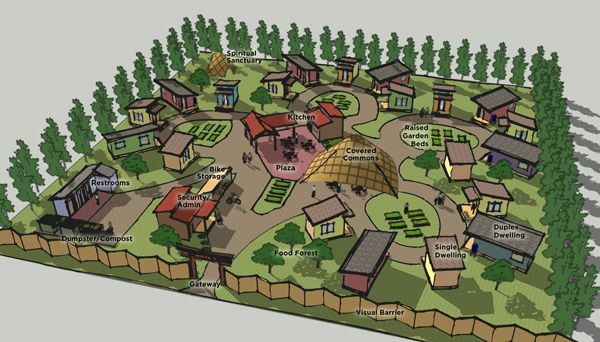 The goal: figure out how to transform an asphalt lot into a fully functioning, sustainable village with an emphasis on self-expression. The result: a vibrant village where the air is always filled with music. Currently, 13 wee abodes call the R.V. park home. We recently heard that there’s…MORE room for around 40 more. Monthly rates range from $350 to $550 per month. If you’re looking to ditch the city or burbs for the open prairie, Spur, Texas, the first town in the U.S. to welcome tiny houses, invites you to settle down. The big idea: Tiny house communities are the up-and-coming trend in affordable housing. The almost complete Emerald Village Eugene (EVE) will provide permanent and sustainable tiny homes to those with a low income. It’s a co-op, where all residents will be members, paying $250–$300/month to cover utilities, maintenance and all other community operating costs. In return, residents will build equity, creating a modest asset that could be cashed out if they decide to move on.